With 8 years and counting of experience, and a full year of intense training and development from Salon Vanity, Allyson loves to perform any transformation. With her combined skills from her home town of Wilkes-Barre Allyson is ready to bring her inspiration to Philadelphia. 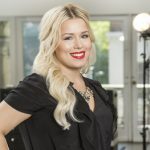 She is a L’Oréal certified hair colorists, who focuses on a wide range of services from corrections, cutting, keratin services, formal styling and make-up applications. She believes the greatest tool to use would be her ears to listen what the client truly envisions and will work closely to achieve their desired result.